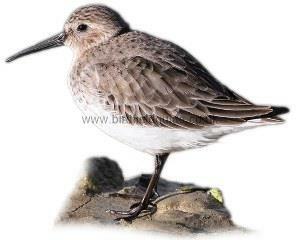 In winter the Dunlin is mostly grey-brown in colour with a long tapered black bill which is slightly curved bill. The Dunlin's breeding song is unmistakable and it can often be seen hovering in the air high above the nesting site making it's charismatic trilling. 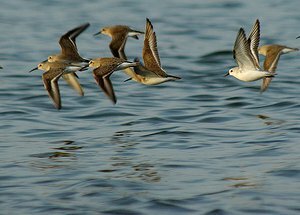 In winter the Dunlin can form large flocks, sometimes into the thousands, making a spectacle as the fly over estuaries in synchronised 'clouds'. Not the black underside on this bird, which is very distinctive in flight. The black speckling on the neck is particularly prominent from a distance. Dunlin can form large flocks in winter, note the white underside of these birds in flight and the white wing bar. 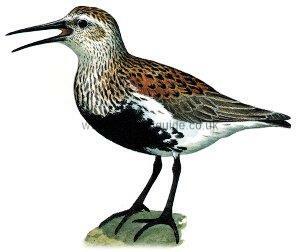 The Dunlin in summer has a rich chestnut back with a bold black underside, the neck is speckled black. 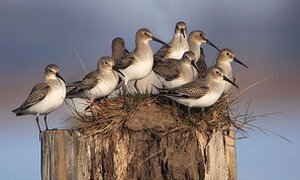 This wonderful image shows Dunlin in winter plumage roosting, note the white eye stripe which appears particularly prominent on these birds. Also note the long slightly curved bills. 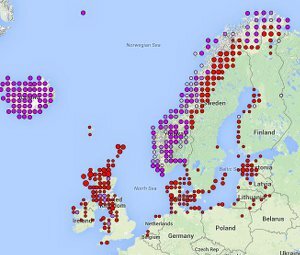 In the summer time the Dunlin breeds on the Northern tundra of Europe. In the UK it's main breeding area is Scotland although there are some in the South. In winter time it can be found right around the UK coast. Usually nests on wet moorland and pasture. In the winter it can be found on a variety of different types of coastline but mainly open muddy estuaries. 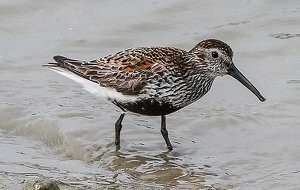 Several shots of Dunlin, all in winter plumage.